The Theme for December is: A Brief History of Timeless Things. Each product in the December Beauty Box is a portal to travel through time and space, with ingredients that have been part of ancient cultures. This luxurious facial serum created by Johanna Everingham tells stories that began 5000 years ago. It is crafted with impeccably sourced ingredients, each chosen for its specific benefits to the skin : Tasmanian calendula, Daintree vanilla bean, papaya seed oil from India, seabuckthorn fruit and seed oil from Germany, pomegranate seed oil from Israel, raspberry and blueberry seed oils, two kinds of frankincense: from Somalia and Oman , two kinds of myrrh : from Somalia and Namibia, certified cosmetic grade, non-nano 24 K gold from a family owned company in Germany. 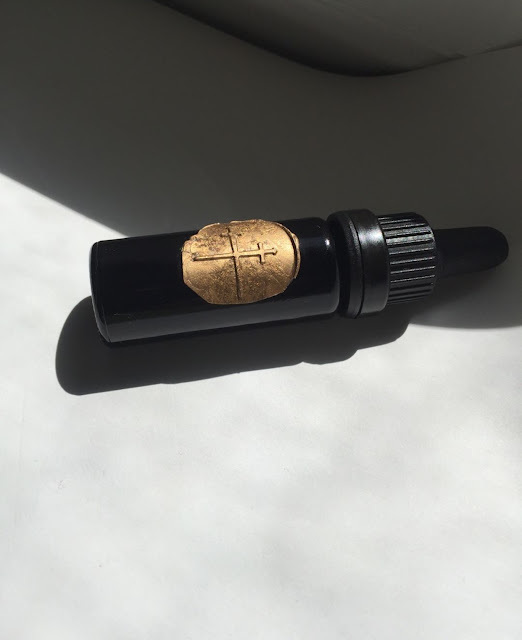 Notes from Me: This is just a beautiful day time oil serum as it is full of antioxidants and sun-protecting ingredients.Johanna has designed this serum/oil to be regenerative, exfoliating, moisturizing, replenishing and as a 'do it all', for all skin types and for any time of the year. This unusual under-eye treatment has been formulated by Dafna Shaham as a serum-in-lotion for the delicate eye area. Ayurveda meets Biotechnology to create a treatment that is uniquely effective and fast absorbing. Chicory Oligosaccharides and natural peptides stimulate collagen production and synthesis. Additionally the chicory oligosaccharides are injected into a 3D matrix that allows its sequential delivery to the skin under the eyes. This leads to an immediate lifting effect as well as a long term hydration and firmness to the delicate skin under the eyes. Aloe hydrates the skin, Rosehip reduces the appearance of fine lines, calendula extract reduces puffiness, hibiscus extract inhibits the breakdown of elastine keeping the skin elastic and soft. Eye care also wears beautifully under makeup as it is cream based rather than oil based. Notes From me: You need the tiniest amount of this, barely half a pump. Using your forefinger or ring finger, you tap it into the skin under the eye area. Dafna recommends tapping vs massaging the product in, as it helps it absorb better and ensures that not too much product is used. I also find that tapping a small amount works beautifully and works very effectively to brighten, smooth and de-puff the under eye area. 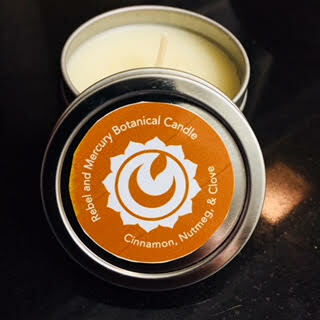 The chosen scent is Cinnamon, Clove, Nutmeg, and is made completely with only essential oils and absolutes, in a proprietary base of a soy-free, palm-free coconut wax blend with a lead-free cotton wick. Nikki Sherritt, the creator of Rebel and Mercury (formerly Gabriel's Aunt) is something of a pioneer in the field of natural candle making and has been making natural candles for years, both for her own brand as well as for other brands. Notes from me: I first tried Nikki's candles around eight or so years ago and fell completely in love. Her scents are complex and addictive. So much so, that with some of the scents, I sometimes dip my fingers into the wax and use it as solid perfume. That looks so luxe! I love the packaging! I agree and can't wait to receive the actual box! Boxwalla is the perfect cruelty-free green beauty box! I highly recommend them! That scent sounds so warm and inviting. I can't wait to receive mine so that I can smell and review!! This is the most impressive cruelty-free, green beauty box! The packaging looks so mystic! So cooL! I agree! I can't wait to receive my box! I agree with your assessment, Allison! I am so excited about receiving this box, and can't wait until it arrives! I do love my luxe green skincare products, A LOT! Such an interesting box with a great variety of products. I want to know more about the eye cream once you use it. I agree, it really is! I can't wait to try the eye product as well! I simply cannot wait for my box to arrive– I am so excited! Wow, this box always looks so impressive! I agree, Bailey! Every single Boxwalla box has been absolutely amazing!